Last summer, while visiting the Saturday Market in Portland, Or. I came across this lady selling tank tops that she had so creatively sewed handkerchiefs to. From ladies sizes on down to little girls sizes, and she even was selling little tank dresses with beautiful hankies sewed on the shoulders. I have been searching for her site on the internet but for the life of me I can’t remember her name. I thought it probably wouldn’t be to tough to do, so I started cutting and sewing and here is what I came up with. Cut the Handkerchief in half diagonally. Buy a tank top, or use one you already have. Pin the hanky on both sides and make sure they line up. Then sew it on and your done. 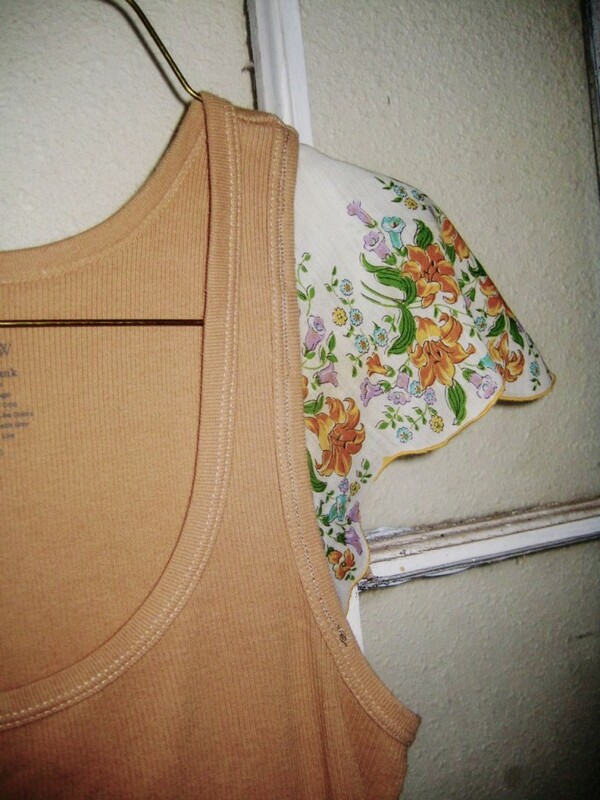 This entry was posted in DIY, I made this!, recycle, Thrift Finds on June 11, 2009 by Deanna.